The Pink Palace has earned the reputation as one of the world’s most famous youth hotel & hostels. Located on the beautiful shores of Agios Gordios Beach, the beach resort caters to travellers of all ages and nationalities by providing food and accommodation at an affordable price. More importantly, it’s known for hosting daily activities and nightly parties which have created fond memories that have been talked about over the past few decades of business. 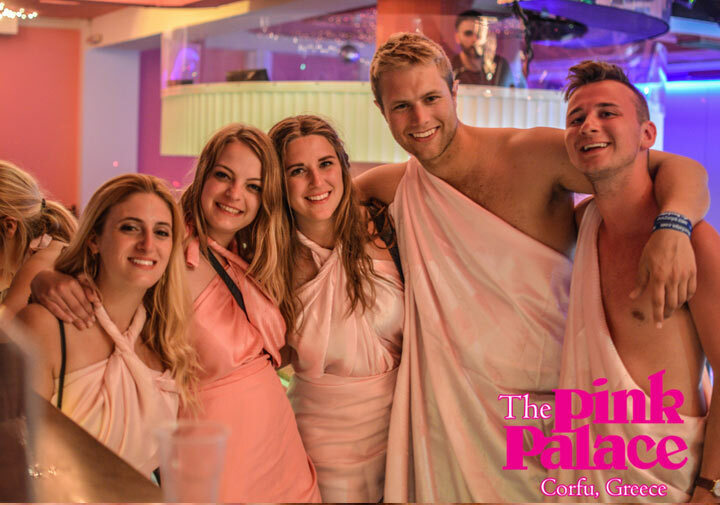 The Pink Palace is without a doubt the best nightlife spot at Agios Gordios beach, as the it’s known for dancing, shots of ouzo, happy hours, and theme nights. 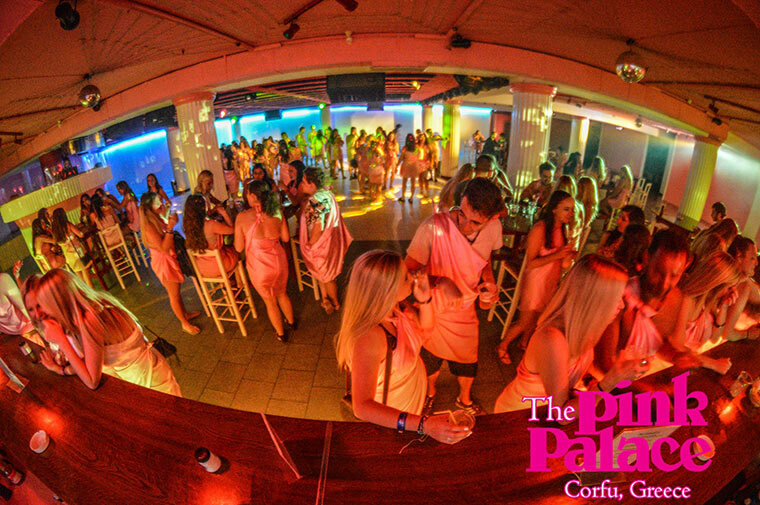 Now, The Pink Palace has opened its doors to visitors to Corfu who want to experience the best parties the island has to offer. Although being a guest certainly has its perks, visitors are welcome to join in on the fun! So what kind of parties does the infamous Pink Palace host? Well for one, the Toga Parties have become a must-attend by travellers from all over the world. Attendees wear PINK togas and partake in the traditional Greek Festivities including a performance by the staff with plate smashing and an “Ouzo Circle”. Like a shot with the Eiffel Tower, riding a camel in the desert, or climbing Machu Picchu, your photo in a Pink Palace toga is one of the staple travel pics you’ll need to add to your collection. Every night there’s plenty of music and dancing whether it’s down at the Beach Bar or the resort’s Palladium Nightclub. You’ll be sure to see guests and staff members up dancing on the bar, taking shots, and letting loose. Come down to The Pink Palace on Agios Gordios beach and discover what the hype about Greece’s famous youth hostel is all about. *The Beach Bar is welcome to visitors, however events at The Palladium Nightclub require sign-up at the reception desk before entry is permitted.